I am logging our Hawaii vacation based on the Facebook posts I wrote. I am also adding a few of the photos I shared to Facebook. 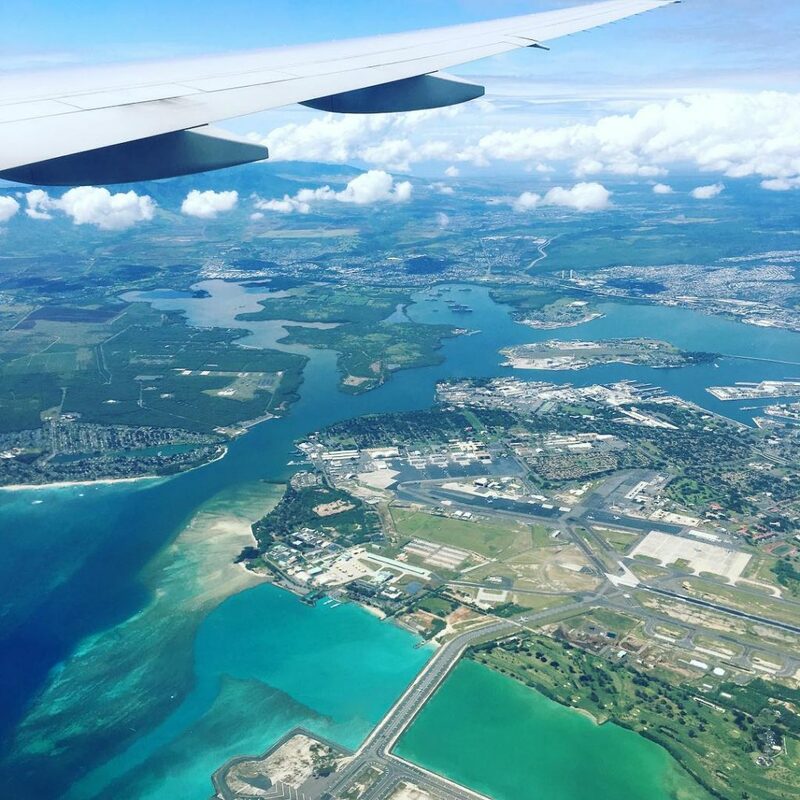 Pearl Harbor and Honolulu Airport/Hickam AFB as seen from our Boeing 777 in the final pattern. We left Denver at 11:30am Sunday and landed in Honolulu at about 3pm, with the 4 hour time change. I’m grateful for the non-stop flight; being on a plane for 7 1/2 hours and crossing an ocean were new experiences for the boys. I wasn’t able to check in for the flight until after Timmy’s MathCounts competition Saturday so we didn’t have the best seat choices — we ended up in a column: middle seats in four consecutive rows. We had a pretty bumpy takeoff, and even though they threatened a bumpy last hour of the flight, it was light turbulence at worst. I was pleased at how quickly we got our bags and arranged an UberXL to take us to our hotel, we were checking in by about 4pm. Within minutes of checking in the boys were in swimsuits and bounding down to the beach: their first time in the Pacific Ocean. You cannot beat the location! The Hale Koa hotel (which translates to “Warrior’s House” in Hawaiian) is designed expressly for those with military credentials. 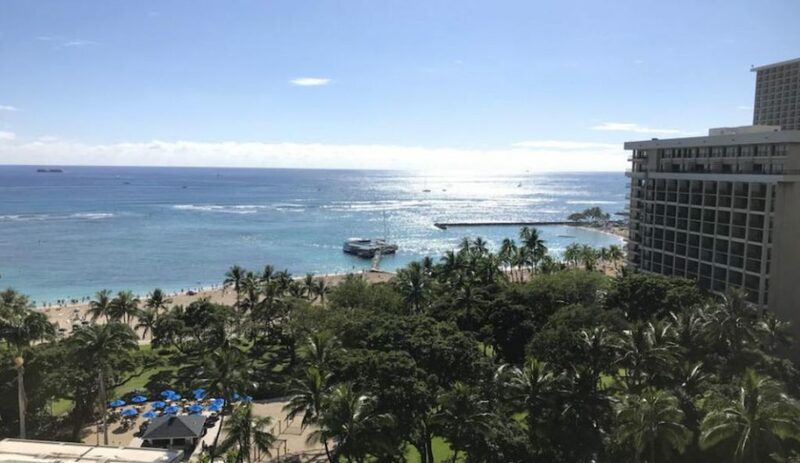 It’s on some of the nicest beach property on Oahu, centrally located among other luxury hotels and high-end shopping and restaurant action. Room rates vary based on the rank of the military member sponsoring the guests, but for us to get an oceanfront room on the 12th floor for less than $200 per night during Spring Break season was absolutely incredible. The property is beautiful, with plenty of attention given to cleanliness and attending to guests’ needs. The gardens are amazing and they have free tours of the gardens every Thursday morning. The pools and bars are well-maintained, with the friendliest towel attendants! And of course, there’s the entertainment, including the best-on-the-island luau show (for a separate review). Our family didn’t eat at the higher-end restaurants, but we did enjoy eating at Happy’s, the Barefoot Bar’s walk-up food counter, and the Mongolian Grill they offer on weekends for dinner. My only “complaint”, and the reason I didn’t give the hotel 5 stars, is the size of our room. The photos on the website don’t give an accurate picture, our family of four was really crammed in there. At least we had a patio/lanai with two chairs that helped with the space some. The bathroom and closet are quite small also. We stayed for 5 nights. As my sons are getting older, I think we will need two rooms of this size for future visits. For those who didn’t know, I lived on Oahu (Waianae) from 1977-1980 and hadn’t been back except for two flight layovers I had in the 1990s. I am excited to show the boys where I used to live on the leeward side of the island. We checked out the hotel’s beach, the pool area, Hawaiian shave ice at the snack bar, and the Barefoot Bar. An outdoor Mongolian Grill set up nearby and that’s what we ended up having for dinner, even though a Korean BBQ restaurant had caught our attention right across the street. That can be for another night. After enjoying our dinner while watching the sunset, we wandered some of the gardens on the property, continued to explore the hotel, and are now getting ready to go to sleep. The four-hour time change will probably make for an interesting morning, and I’m sure by the time we get used to it, it’ll be time to come home. On the beach in front of the Hale Koa. Our hotel room was near the left edge of the building behind them, 3 floors down from the top. 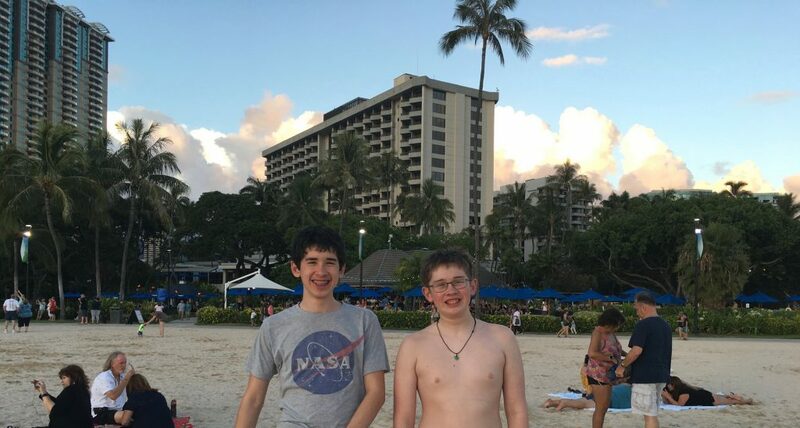 Our sons were so happy to be on a tropical beach again after so long! Here’s the view from our room’s balcony! 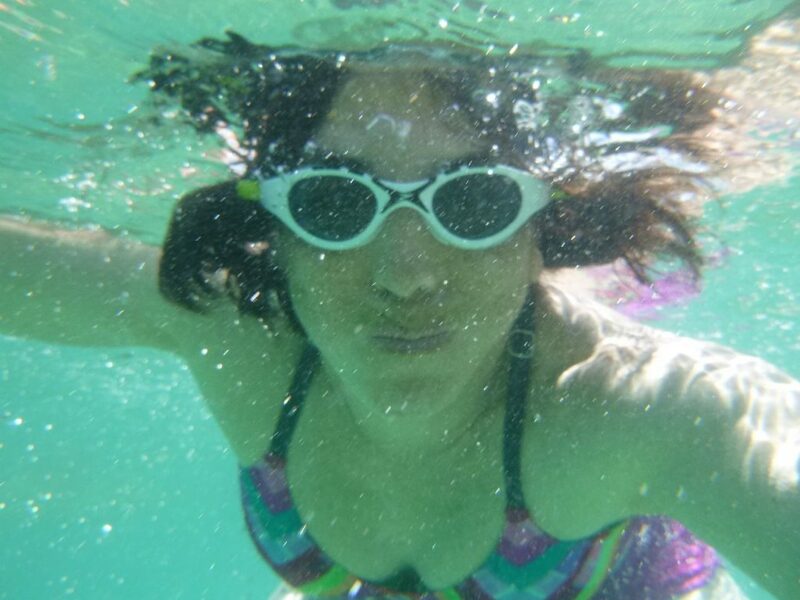 Today was a beach/pool day. We enjoyed the sun, the air traffic right over the beach (so many F-22s! ), the clouds floating by, and the people-watching. We enjoyed the sun a little too much — we had to stop at the BX at the hotel to pick up some aloe gel. I hope the boys sleep okay tonight, they’re pretty baked. Bottom line up front: This particular luau is for those with Department of Defense credentials. From the ticketing website: “The Hale Koa Hotel is an Armed Forces Recreation Center. All events require a valid Active/Retired U.S. Military/DoD ID card or sponsor to attend.” You can attend as a guest of someone with those credentials — but someone with the ID card needs to get the tickets. I bought our tickets online about 3 months in advance, which got our family to the very front and center table — perfect viewing of the dance show. The gates open at 5:30pm for the pre-event activities. You’ll be greeted with mai tais and seashell leis upon entering (virgin mai tais are available for those who don’t/can’t consume alcohol). 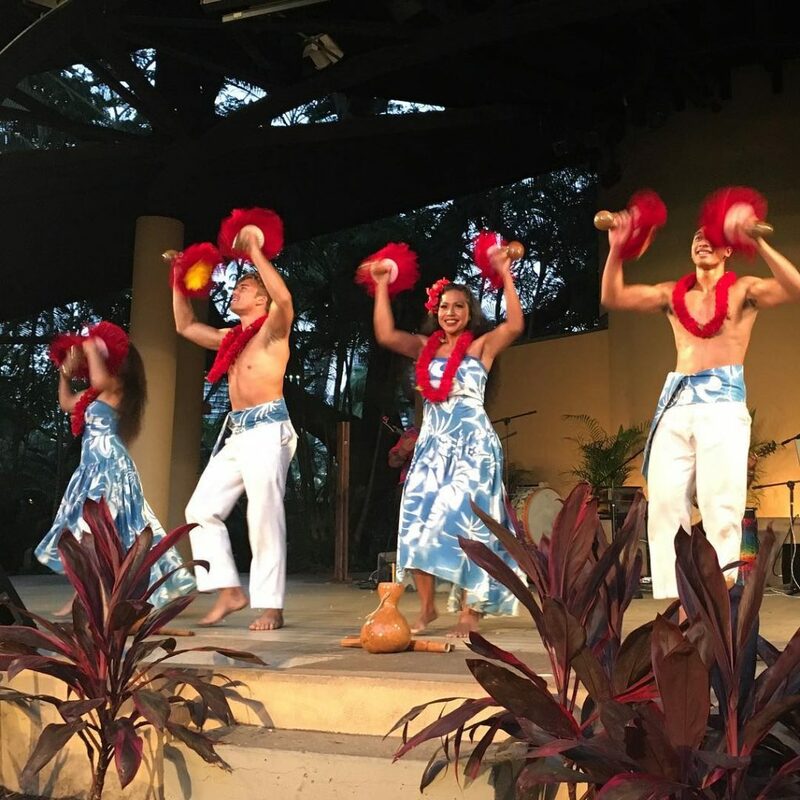 The pre-event activities are fun for all ages: there are activities for the kids and the luau band will play music in the gazebo. There was a Polynesian clothing demonstration and hula lessons. They will introduce “Cousin Ono” who climbed a coconut tree for us and talked about some of the Polynesian traditions we’d get to experience during the luau. At around 6:30pm the guests will hear the conch shells and view the pig getting dug up from the ground. Dinner is served at about 6:45pm, with the dance show beginning at about 7:30pm. The kids will get served first, then the adults. The food was all delicious, and there was plenty of it: I couldn’t finish it. Glenn Madieras, a 1980s teen idol, is the emcee for the show. He does a decent job with the transitions between the dance act, even though some of his acts were a little corny. The dancing is beautiful and well-done. The fire-knife dancer is simply amazing. Our family appreciated the final dance — an ode to the military members in the audience. Most of the guests were wearing Hawaiian shirts and dresses — suggest you dress somewhat nicely for this event, but don’t worry, flip flops are fine! I’m now waiting for the kids next door to finish practicing their ukulele so I can go to sleep…I think they’re teens and they actually don’t sound badly. It’s just loud.